Both green building standards and environmentally-conscious customers require independent third party assurance that fabricators use wood harvested from responsibly managed forests. Columbia Forest Products is no stranger to the leading forest certification program in the global marketplace today – the Forest Stewardship Council® (FSC). Columbia was the first decorative hardwood plywood and veneer manufacturer in North America to secure a FSC chain-of-custody certificate through the Rainforest Alliance in 1998. Columbia offers the industry’s most complete line of certified decorative hardwood panel products which carry the FSC label. Unlike other forest certification programs, the FSC is the only certification program endorsed by the internationally recognized US Green Building Council’s LEED® Green Building Rating System requirements and the International Living Future Institute Living Building Challenge. Decorative panel product choices include a broad selection of decorative veneers laminated to certified veneer core, particleboard and MDF substrates. By choosing Certified Wood panels from Columbia for cabinets, furniture, store fixtures, and other artisan uses a direct connection to responsibly managed forests is made with no sacrifice of design or performance needed for today’s demanding project work. Since 1998 Columbia has not only built the most extensive decorative hardwood plywood product line, but also the means to deliver these panel products through the largest hardwood plywood distribution network in North America. With this impressive aggregation of “A-List” chain-of-custody hardwood plywood distributors, securing FSC®-certified panel products is much easier. With ten manufacturing facilities and one international brokerage group certified under a multisite certificate in the United States [RA-COC-000065] and Canada, Columbia customers are offered an abundant, reliable supply of certified wood products. The Certified Wood panels Columbia manufactures are invoiced as FSC Mix. Panels are manufactured to stringent North American ANSI HP-1 standards. 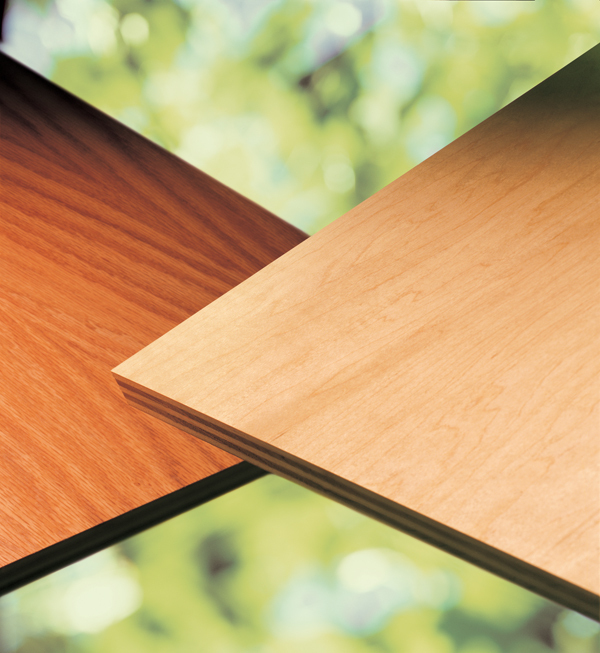 Decorative veneers can be laminated to FSC®-certified veneer core, or pMDI-bonded MDF substrates with the patented Columbia PureBond formaldehyde-free lamination process. These substrates will vary by the wood sourcing “baskets” Columbia draws from in North America. While nominal finished thickness of 1/4″, 1/2″ and 3/4″ are the most common, Columbia also specializes in many other thicknesses, including metric to meet those “one-of-a-kind” project requirements. Columbia has a three-part specification available for download to assist specifiers in the documentation of FSC-certified panel constructions.